Primary and Secondary Healthcare department (P&SHD) Punjab announces 935 jobs in 85 THQ hospitals of 36 Districts upon their requirements and demand as well to revamp the structure of health in hospitals. In order to enhance the transparency and merit throughout the recruitment process the P&SHD has assigned this crucial responsibility to National testing service (NTS) for Synchronizing the most appropriate candidate for above said vacancy. NTS is an autonomous body mainly designed for the recruitment purposes for various organizations based on meritorious standards accordingly. NTS will ensure all necessary arrangements and shall manage the whole recruitment process for Primary and Secondary Healthcare NTS Jobs as from taking test to the final selections. NTS will also ensure the merit and fairness throughout the process. Human Resource & Legal Officer. Primary and Secondary Healthcare Department (P&SHD) delivers quality healthcare services to the community through an efficient and effective service delivery system that is accessible, equitable, culturally acceptable, affordable and sustainable. P&SHD aims to improve the health and quality of life of all, particularly women and children, through access to essential health services. Applications are invited from suitable and eligible candidates across the the Punjab by P&SHD for Logistic Officer Jobs. Procurement Officer:- Masters degree in Finance/MBA in Finance/ B.Sc. Engineering/ Pharm D/Economics/Statistics/M.com or equivalent from HEC recognized University having minimum experience of 1 year. Admin Officer:- MBA Finance/MBA Administration/Statistics/Computer Sciences/ M.com/B.Sc. Engineering/ Pharm D or Equivalent from HEC recognized University with minimum experience of 1 year. Human Resource & Legal Officer:- Master Degree in HR/ Public administration/ MBA Management/ Administration/ LLB/M.com or equivalent from HEC recognized University along with 1 year experience. IT/Statistical Officer:- Master degree in computer Sciences/ MCS/ BSCS Hons/ M.Sc. Statistics/ MBA/ M.com/ B.Sc. Engineering or equivalent from HEC recognized University with 1 year experience. Finance & Budget Officer:- Master Degree in Finance/MBA/M.com/CA inter/ ACCA or equivalent from HEC recognized University or Officer from Treasury Service/Subordinate Accounts Service with 1 year experience as well. Quality Assurance Officer:- Master in Total Quality Management/Master in Public Health/Master in Health administration/Master in Hospital Management/Masters in Biochemistry/Molecular Biology/Microbiology from an HEC recognized University or equivalent having 1 year minimum experience as well. Assistant Admin Officer:- Master in Social Sciences/Public Administration/MBA/ACMA/ACCA/Statistics/Computer Sciences/M.com/Pharm D or equivalent. Logistics Officer:- M.Sc. Supply Chain Management/MBA or Equivalent. Data Entry operator:- B.A/ B.Sc./ B.com/BCS or equivalent from HEC recognized University. in case of B.A/B.com Candidate must have 6 months Computer Course/Diploma. Certain important guidelines are being given about Primary and Secondary Healthcare NTS Jobs given below. All government employees are also eligible through proper channel. The above positions are offered on contract basis for one year under the contract Appointment policy 2004 of the Government of Punjab. There will be 100% domain knowledge test for these posts. The provincial quotas shall be applicable for the aforesaid posts 15% for women, 5% for minority and 3% for disabled persons. The competent authority reserves the right not to fill/increase/decrease the number of vacancies or cancel the recruitment process without revealing no reason. Candidates shall have at least 50% score in NTS test to qualify. General Age relaxation in upper age limit for male candidates is 5 years and for female is 8 years. The maximum age limit as mentioned in above schedule shall be raised by 10 years for disabled person to be appointed against quota for disabled. Roll number slips shall be issued to candidates one week before the test. Incomplete application or application received after close of office hours on the last date for submission of application will not be entertained. No TA/DA will be admissible to candidates. The candidates shall clearly mention the order of his/her THQ Hospital. Shortlisted candidates have the right to alter/modify it at the time of interview. The candidate shall specifically mention the name of THQ against which the application is submitted. The Procedure for Primary and Secondary Healthcare NTS Jobs Jobs is going to mention in detail as followed. Candidates shall submit duly filled application form, along-with deposit slip of prescribed fee in favor of NTS, attested copies of CNIC, educational and experience testimonials, latest Curriculum Vitae and two recent passport size photographs, directly to NTS through courier on the address as mentioned on the application form. Test fee shall be paid in any branch of HBL, Meezan, MCB, or ABL on prescribed bank Challan. Incomplete applications or applications received after close of office hours on the last date for submission of application will not be entertained. Roll No.slips shall be separately dispatched directly to candidate by NTS at least one week before the test. Delivery Unit(HISDU) of Primary & Secondary Healthcare Department. 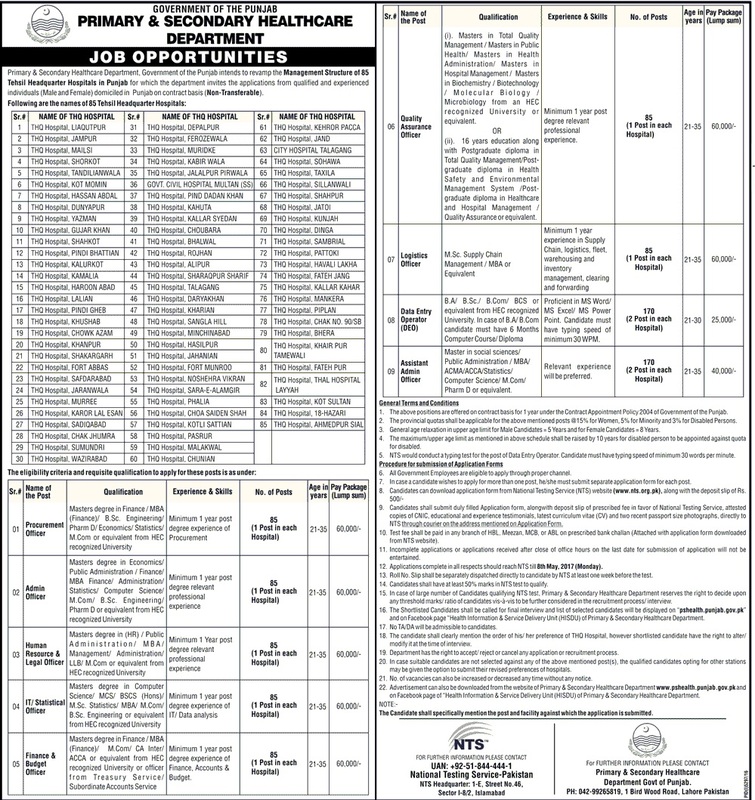 Last date for the submission of application on Primary and Secondary Healthcare NTS Jobs is 8th May,2019. For Getting more updated information please keep in touch with us accordingly. sir, when the remaining queriesafter nts test will be entertained?? I have qualified NTS test for the post of Finance & Budget Officer. Kindly guide me about next procedure & how much time i have to wait.